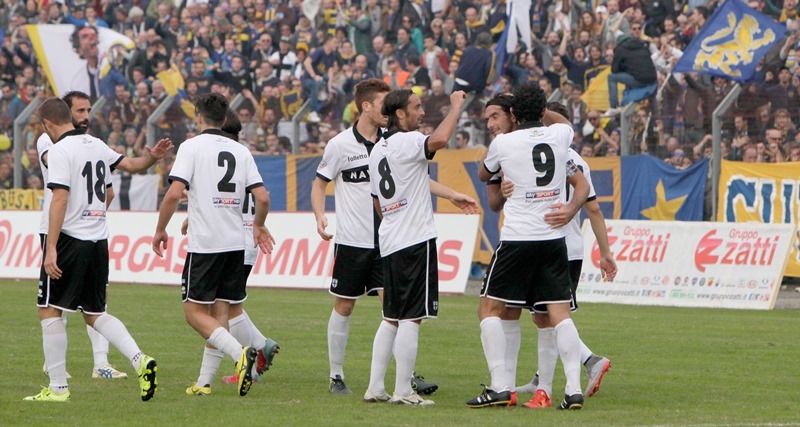 Brescello, October 25th, 2015 – After a home draw with Forlì last Sunday, Parma Calcio 1913 returned this afternoon to victory in the championship, beating Lentigione on the road at Stadio Morelli di Brescello in front of three thousands of their own fantastic fans. It was a complete success, with a 0-3 result (box score below). After a difficult beginning, Luca Cacioli scored in the 24th minute on a header from a free kick served into the middle, and then Christian Longobardi at the end of the half (46’), taking advantage of the uncertainty of the home side, in particular of the goalkeeper Daniele De Angelis. 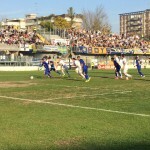 In the second half, with Lentigione down to ten men with the sending off of Hicham Miftah (double yellow), Parma extended their lead with a third goal, again scored by the striker Longobardi (86’), headed in from a great cross from the right by Michele Messina. Parma Calcio 1913 continues to remain unbeaten at the top of the table of Girone D of Serie D.
LENTIGIONE: De Angelis, Santagiuliana, Vecchi (1’st Ferrari), Savi (Cap.) (35’st Roma), Narducci, Galuppo, Berti (17’st Tarana), Fyda, Mezgour, Miftah, Pandiani. All. : Zattarin. Bench: Medioli, Addona, Opoku, Pessagno, Tortora, Chiurato. PARMA CALCIO 1913: Zommers, Messina (43’st Adorni), Saporetti, Giorgino, Cacioli (V. Cap. ), Lucarelli (Cap. ), Lauria (35’st Musetti), Miglietta, Longobardi, Baraye (25’st Melandri) Ricci. Coach. : Apolloni. Bench: Fall, Benassi, Rodriguez, Corapi, Guazzo, Sereni. Referee: Sig. Francesco Meraviglia di Pistoia. Assistants: Sigg. Dario Garzelli di Livorno e Lorenzo Colasanti di Grosseto. Notes – Corner Kicks: 5-4. Yellow Cards: Mezgour (35’pt), Miftah (46’pt), Saporetti (5’st), Narducci (42’st). Red Cards: Miftah (double yellow) (13’st). Shot off crossbar by Savi (3’st) and Lucarelli (34’st). Stoppage time: 1’ in the first half, 3’ in the second half.